Legion is a rich and rewarding expansion pack for followers of Warcraft lore, but with a plot revolving around a demonic force attempting to wipe out all life on the planet, not every storyline is going to have a happy ending. This is the unhappiest of them all. Spoilers for World of Warcraft: Legion follow. Many tragic events led up to the launch of Legion, and many more are certain to follow as the narrative is expanded through updates. For many the biggest tragedy thus far might be the loss of leaders on both sides of the Alliance and Horde conflict. King Varian Wrynn of Stormwind’s heroic sacrifice brought a tear to many Alliance players’ eyes, and I am sure the death of whoever the warchief of the week was over on the Horde side wet some tissues as well (though way to upgrade, Hordies). For me, the most tearjerking moment of the expansion transcends faction lines. It’s the story of a dragon. As the Legion expansion gets underway, players are asked to choose from one of four starting areas to begin their hunt for the Pillars of Creation, powerful ancient artifacts said to hold the key to Azeroth’s salvation. One of these areas is Val’shara, ancient home of the druids. It was in Val’shara that Cenarius, Lord of the Forest, granted Malfurion Stormrage his powers as Azeroth’s first Druid. It’s a land where nature is sacred. 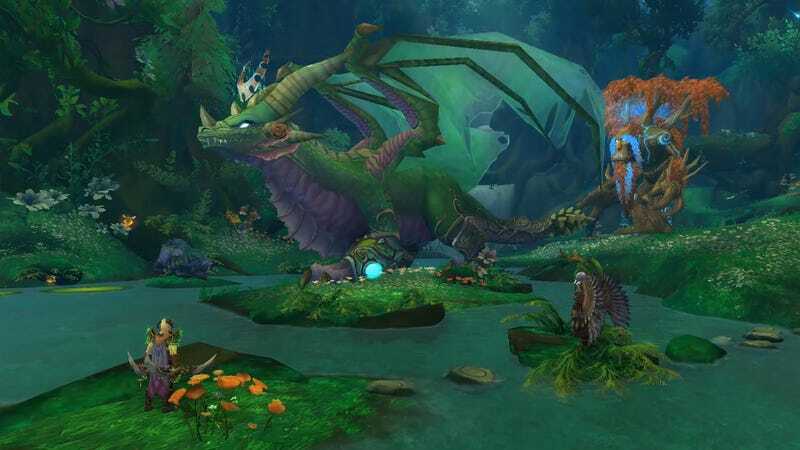 A land under the protection of Ysera, the former green dragon aspect, protector of the Emerald Dream and Azeroth itself. Ysera is pretty much everybody’s grandmother. Well, to Cenarius she was more of an adopted mother, but to everyone else, she’s somewhat of a granny. Sometimes she has trouble determining what is real and what is dreams. Sometimes she goes a little mad and is used by evil for dark purposes. But generally she’s protective of all the beings of Azeroth. And sometimes she’s a very attractive elf with horns. Just keep thinking grandmother. Of the four starting zones in Legion, Val’shara sounds like the easiest. Malfurion and Cenarius already have the zone under control, and all that’s needed is for the player to go pick up the Tears of Elune, one of those missing Pillars of Creation. Easy. Fun! Green. Players are greeted by a jovial Malfurion Stormrage, eager to introduce them to the Lord of the Forest himself. A Malfurion ride later they arrive in the Grove of Cenarius, only something is amiss. Cenarius has been struck down by demonic corruption, and all of the Emerald Dream is threatened. Malfurion sends the player off to gather three Arch Druids in order to perform the ceremony required to call for aid. Slowly everything begins to unravel. One of the three Arch Druids has already succumb to corruption, revealing the villain behind the plot as Xavius, the Nightmare Lord. Xavius, once one of the most powerful mages on Azeroth, succumbed to demonic influence during the first Legion invasion, becoming the first satyr and eventually the Nightmare Lord, a being that embodies corruption. He has a major bone to pick with Malfurion Stormrage and his now-wife, Tyrande, and he means business. Back at the Grove of Cenarius the assembled Druids summon Ysera, who appears in her majestic green dragon form. She confirms the threat and tasks the assemblage with defeating Xavius and recovering the Tears of Elune. But Xavius is one step ahead of the Druids. When the player arrives to retrieve the Tears, Xavius appears, having already secured the relic for himself. When the player returns to the Grove to report this, tragedy strikes. It is too late to save the Lord of the Forest from corruption. The loss of Cenarius drives Malfurion into a rage (funny that). He flies off to confront Xavius, which is a pretty bad idea. The player and Ysera pursue. The Nightmare Lord is one of the main villains in the Legion expansion, and what happens next demonstrates why. Malfurion runs straight into a trap, but he’s not the only one. During an attempted rescue of the First Druid, Ysera charges Xavius. It does not go well. Ysera, made mortal following the battle with Deathwing following the events of the Cataclysm expansion, lacks the power to resist the corrupted Tears of Elune now embedded in her chest. One of those most powerful dragons on Azeroth is now the enemy. She and Xavius make off with Malfurion, as the Druid’s wife arrives. Xavius leads the player and Tyrande on a chase through the corrupted forests of Val’shara, taunting them all the while with Malfurion’s blood, feathers and plaintive cries. When the pair finally catches up with the Nightmare Lord, he gives Tyrande a choice—stand by her husband as he breathes his final breaths, or save the Temple of Elune from the corrupted Ysera. Tyrande chooses to save the temple of her Goddess, one of the hardest decisions she’s ever had to make. As she and the player ride towards the faithful confrontation, she speaks of her love for Malfurion and bemoans having to put down the most beautiful creature she has ever known. And then I cried through an entire extended battle with one of my favorite characters in World of Warcraft lore. Ysera falls, and Blizzard really earns those tears with the cutscene that follows. I’ve played through this sequence of events five times now on five different characters, and it never gets any easier. It doesn’t help that I’ve been on the Ysera server since launch. Every time I log in I feel a twinge. All that’s left of my old in-game friend is a dragon-shaped patch of grass and flowers rising from the Temple of Elune’s cobblestones.